The process water from a candy manufacturing process will usually constitute emulsified and free fats, oils, and grease (FOG). Free FOG will separate naturally from water because FOG is hydrophobic (water fearing) and weighs less than water. Free FOG will float on the surface of water and can therefore be removed from the water using an oil water separator like Ecologix’s SkimLoop system or conventional oil/water separators. Emulsified FOG has been either physically or chemically stabilized in water. Physically emulsified FOG typically gets that way through a lot of mechanical agitation. In a wastewater application, it’s normally the impellor of a centrifugal pump that mechanically emulsifies formerly free FOG. This agitation is similar to a blender. It mechanically sheers the FOG into droplets so small that it can take a long time before the oil droplets combine with each other again to form larger droplets and separate as free FOG. Chemically emulsified FOG has typically become stabilized in the water through the use of chemical surfactants (a.k.a. soaps). Detergents and industrial cleaning agents form chemical bonds with FOG, which changes the charges around the fatty acids and hydrocarbons. In effect, it causes the normally hydrophobic side of the fatty acid, or hydrocarbon to have different charges, which can now interact with polar water molecules. In order to break the chemical and mechanical emulsions of FOGs, you need to add a chemical known as a coagulant. This chemical interacts with the charged surface of particles and FOG to destabilize them and cause them to coagulate together. Another chemical, called a flocculant, is added to the water. The flocculant is a very long chained polymer with a specific charge. It acts a large net in effect, and pulls together all the coagulated particles to form sludge. 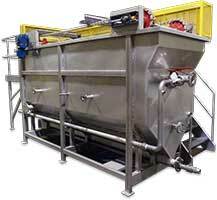 Now at this point, the sludge can be separated through Dissolved Air Floatation (DAF) or settled in a Clarifier. Q. Why can’t I simply use a grease interceptor or some type to capture the “free” FOG? A. Most candy manufacturers produce wastewater that contains free FOG as well as emulsified FOG. If the free oils are vegetable based, then an oil water separator will be useful in helping remove these oils from the wastewater. If these free oils are animal based however then a DAF will be required to remove them. A DAF is also the best solution to remove the emulsified FOG that will be present in most food processing waste streams including candy manufacturers. Q. How can I save money using an engineered solution to my wastewater handling? A. By removing the free floating FOG at the start of the wastewater treatment process the factory will realize a significant reduction in coagulant and flocculant costs when removing the remaining FOG and suspended solids at the DAF stage. Q. What is the ideal setup to use to handle my candy manufacturing wastewater treatment? A. You’ll need a chemical reaction tank between your equalization tank and the DAF system. Next to that would be your chemical feed pump skid, which usually contains a coagulant feed pump and caustic soda feed pump to adjust pH. The water would then flow by gravity to the DAF flocculation tubes, which sit underneath the catwalk of the DAF vessel. Into those tubes is injected an activated polymer, which binds all the coagulated solids and FOG into larger pieces of sludge that can be floated in the vessel. The sludge gets scraped off the surface of the DAF system and pumped via an air operated diaphragm pump to conical-bottom sludge holding tank. You can choose to insert decant valves along the side of that tank to decant clear water out of the tank, or pump the wet sludge directly into your dewatering system. The type of dewatering system you choose will depend on your budget and automation preferences. On the inexpensive side you can choose a simple sludge dewatering hopper. It won’t give you the driest sludge, but it’s relatively inexpensive and has no moving parts to worry about maintaining. You might also consider using a filter press. If you have a lot of FOG in the sludge you’ll need to prepare it with diatomaceous earth before pumping it into the filter press.